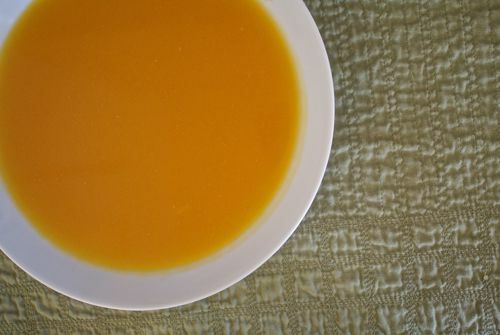 Start with this basic butternut squash soup recipe and then use any of the variations and garnishes below—or add your own flair—to create your own version of the perfect Butternut Squash Soup. Halve, seed, peel, and cube the butternut squash. Set aside. Halve, peel, and chop the onion. Mince the garlic, if you're using it. Heat a large pot over medium-high heat. Add the butter or oil and the chopped onion. Sprinkle with 1/2 teaspoon salt. Cook, stirring occasionally, until the onion is soft, about 3 minutes. Add the squash and the broth. Bring to a boil. Cover, reduce heat to a simmer, and cook until the squash is tender, about 20 minutes. Creamy: Add 1/3 to 1/2 cup heavy cream after blending and gently heat until warmed through. Spicy: Add 1 chopped jalapeno chile and 1/4 teaspoon cayenne with the garlic. Stir in up to 1/4 cup brown sugar at the end. If you like, cream is also a nice addition to this version. Roasted: Roasting concentrates the flavor of the vegetables. You can use this method with any of the other flavor combinations you like. Put halved and seeded squash cut-side-down in a large pan. Arrange halved, peeled onions and garlic around squash. ﻿Pour in 1 cup broth and roast in a 375 F oven until very tender, about 30 minutes. Let cool slightly. Scoop out the squash flesh from the peel and put it in a blender, along with the onions and garlic and remaining broth. Gingery: Add 1 tablespoon grated fresh ginger and 1 teaspoon ground ginger along with the garlic. Make it even gingery-er by melting 4 tablespoons butter in a small frying pan. Cook until it turns light brown and add 1 tablespoon grated fresh ginger. Swirl the ginger butter on top of each serving. Warm Spices: Add a combination of 1/4 teaspoon each ground cloves, cardamon, nutmeg, ground ginger, cinnamon, and/or black pepper along with the garlic. Many Squash! Switch out up to 2 pounds of the butternut squash with sugar pumpkin or acorn squash. Protein Packed: Whirl up to 8 ounces of soft or silken tofu into the soup. Be sure to whirl it in a blender or food processor for a full minute or so to fully incorporate the tofu for a truly smooth and creamy soup.